Time is something you can't purchase. It's absolute, inevitable and always limited. Azad company offers its clients to change the perception of time, “placing” it into their watches. The company is situated in New York and it specializes in luxury category wrist watch elaboration and production. The etymology of the company's name harks back to the ancient Armenian language, from were it moved to the Persian language. “Azad” means “freedom”, which is the company's watch creation concept. The company's founder and, pluralistically, the brand's creative director, Babak Ermankhah and the brand's president, Eddie Egas, have been working in the watchmaking business for over 15 years. Having united their knowledge and creative potential with those of Victor Rodrigues, a jewelery expert and the company's vice president, in 2008, they founded Azad company. Each of them managed to insert his talent and wrist watch design vision peculiarity into the company's products. The meticulous work led to Azad brand's standing up equally with many famous and traditional brands, at the same time offering its clients a little more, than regular watches: a “drop” of fresh design. The watch market scene newbie, Azad company managed to fall into step with “high level” clients. In 2009 Azad company presented its first men's wrist watch. The first collection was executed in limited edition. The 2010 collection is also a limited edition one – it's the “Magic Man Edition”. The official Paulie Malignaggi boxing champion's watch is also a beautiful Azad company's creation. The prices range varies from $750 to $50000. The company also has some other celebrities among its clients: Donald Trump, Lil Wayne, Josh Howard and others. 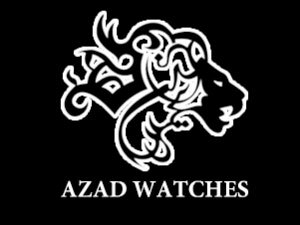 You can buy an Azad watch from the company's official distributors.